Ride from home and feel the adrenaline build while chasing tarmac curves towards your favourite offroad location. No trailer required just twist the throttle of the all-new KTM 690 ENDURO R, which really comes into its own when the dirt begins and the trail gets more extreme. Its new chassis, revised styling, and an updated version of the trusted 690 LC4 motor, are enhanced by upgraded electronics and new WP XPLOR suspension. Master more challenging terrain on this lightweight, high-performance king of versatility. BODYWORK & GRAPHICS: A new era, a fresh look. Heavily influenced by KTM’s competition models the 690 ENDURO R radiates a modern aggressive appearance that begs to be ridden hard, non-stop. CHASSIS: Blasting down remote winding streets, tearing along gravel roads and exploring single-track are all improved on the new 690 ENDURO R thanks to a completely new chassis with WP XPLOR suspension and heavy duty offroad wheels. SUBFRAME: The innovative use of the rear fuel tank as the main structural element of the subrframe, keeps weight low and eliminates design complexity. 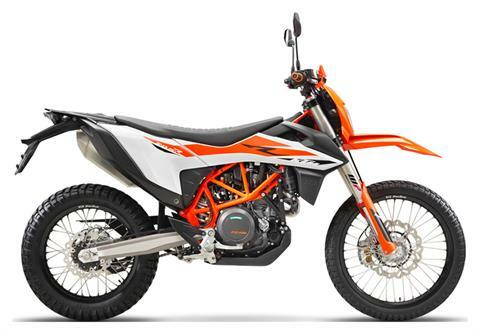 ENGINE & EXHAUST: The latest 690 LC4 engine is all about smooth, powerful performance to propel you effortlessly up, down, through, around and over the many types of terrain that you may encounter on this bike. Every aspect of the LC4 engine design is constructed to provide a consistent and confidence-inspiring riding experience. ENGINE: The engine combines powerful acceleration from the very lowest revs with an outstanding free-revving nature and refined engine running. Another big plus: It's extremely economical with fuel. CYLINDER HEAD: A lightweight, compact cylinder head contains four valves and a single camshaft placed over the intake valves, with a secondary balancer shaft driven by the timing chain. The intake valves are actuated by finger followers and the exhaust valves by a rocker arm. BALANCER SHAFT: Twin balancer shafts, one in front of the crankshaft and the other in the cylinder head, reduce vibration for a smoother ride. PISTON: The lightweight and durable forged piston is designed to reduce reciprocating mass which improves engine response. GEARBOX: The smooth 6-speed gearbox with Quickshifter + allows quicker clutchless up and downshifts when you’re in the thick of the action. This not only enables the rider to be in more control of the motorcycle by keeping a full grip of the handlebars, but also improves rear wheel traction. RIDE-BY-WIRE: The 690 ENDURO R is equipped with ride-by-wire system, which processes throttle twist grip movements with the help of electronic sensors and activates the throttle valves to control throttle action. This significantly improves the response, giving the rider better throttle control of the potent single-cylinder and a smoother ride. INJECTION / ENGINE MANAGEMENT: Electronic fuel injection and engine management allow performance perfectly suited to the riding conditions. The result: even more and even better controlled power, lower fuel consumption, and less emissions, plus the benefit of features like MTC (cornering traction control), MSR (Motor slip regulation), and Quickshifter +. The rider has the choice between three different mappings to influence the engine characteristics. A twin-plug ignition system controls two differently sized spark plugs in the cylinder head independently from each other, for more efficient combustion and a smoother, precisely controlled combustion sequence at all times. ERGONOMICS & COMFORT: The 690 ENDURO R’s ergonomics reflect KTM’s READY TO RACE design philosophy. It’s now much slimmer with a more aggressive feel. The seat height has been lowered without sacrificing ground clearance. This, along with new rubber-mounted lightweight handlebars, enhances overall rider comfort and control. HANDLEBAR: The lightweight tapered 808 mm wide handlebars are rubber mounted to reduce vibrations. Their width and shape are aimed at providing maximum control in all situations. SOFTWARE & ELECTRONICS: Modern electronics and software are discreetly incorporated into the 690 ENDURO R, allowing you to better channel the performance to suit the terrain, conditions and your riding mood.